More than a hundred people crowded into the Soderberg Auditorium to hear Joanne Kyger read from About Now: Collected Poems, published this fall by the National Poetry Foundation. Kyger read poems from every decade of her long career, beginning in the 1950s and ending in the present, and entertained questions from the audience. A full set-list is forthcoming. 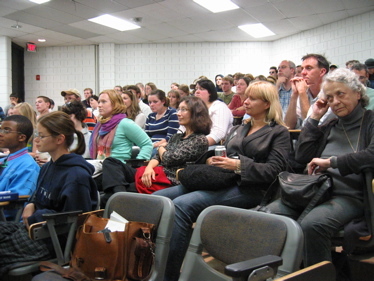 A digital-video recording was made of the event: VHS and DVD duplicates will be available in the UMaine English Department shortly. You can read Benjamin Friedlander’s introduction here. 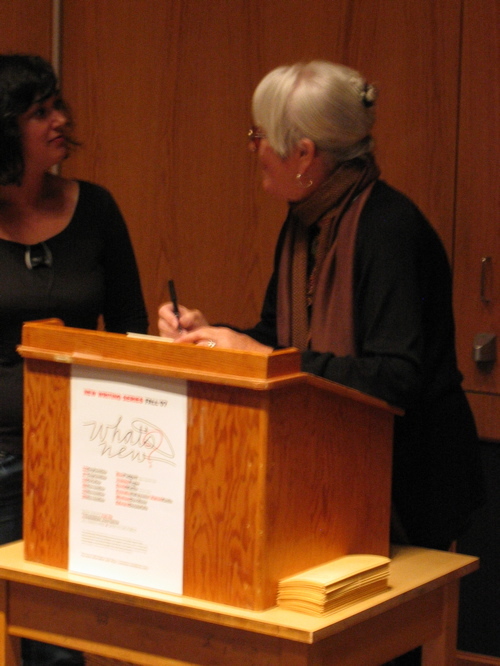 And see other photos of Joanne Kyger on his Flickr page. 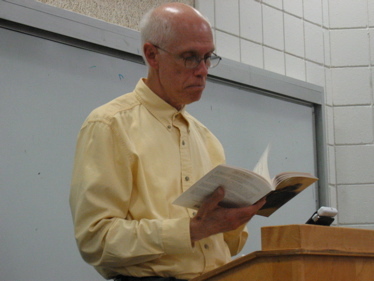 An excerpt from Kyger’s 2000 reading in the NWS can be heard here. Poet Joanne Kyger (NWS F’00) returns to Maine for a four-stop reading tour scheduled to coincide with and celebrate the appearance of About Now: Collected Poems, published this fall by the National Poetry Foundation. 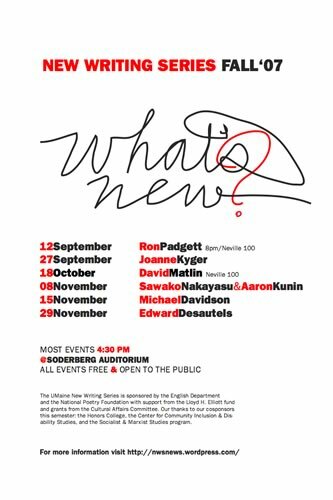 Kyger will read in the University of Maine’s New Writing Series on Thursday, 27 September, at 4:30pm in the Soderberg Center Auditorium in Jenness Hall. For more information about this event, keep an eye on this blog or contact Steve Evans. On Sunday, September 30, the Gulf of Maine bookstore will host a book party and reading by Kyger beginning at 5pm. On Tuesday, October 2, Kyger will read at Bates College. And on Thursday, October 4, she’ll wrap up her tour with a reading at the University of Southern Maine in Portland. 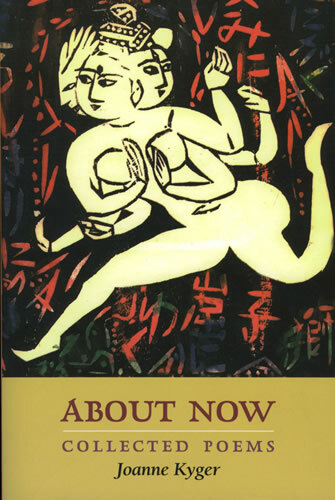 To read Ron Silliman’s review of About Now, which he calls “one of the great books of this or any year,” point your browser here. For a video of Kyger reading recently on the West Coast, visit the UC Berkeley Lunch Poems website. City Light’s bookstore in San Francisco started the festivities surrounding the publication About Now back in July. 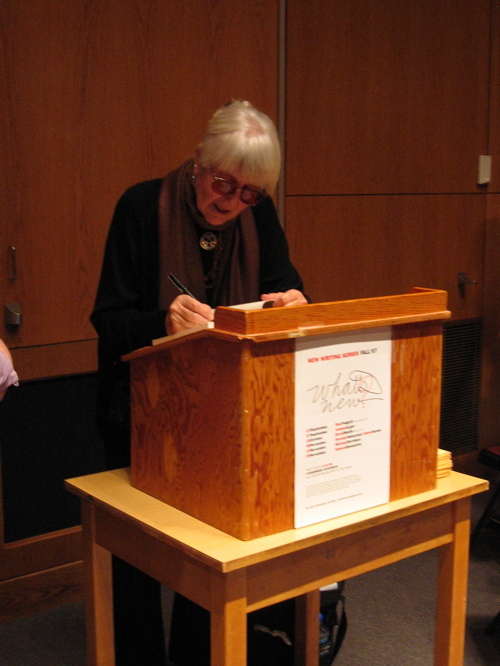 To hear some audio excerpts from Joanne Kyger’s fall 2000 reading at UMaine, visit the National Poetry Foundation’s new website here. 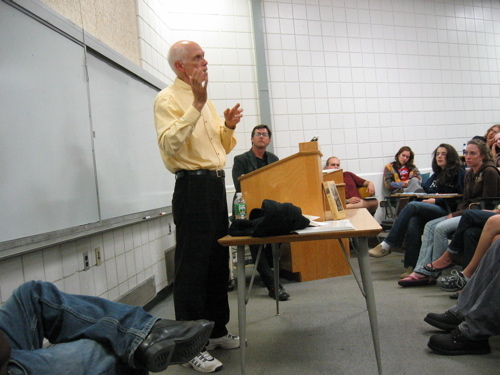 The poet Ron Padgett read before a capacity (and then some) audience of more than a hundred people on Wednesday, September 12, at 8pm in Neville Hall 100. 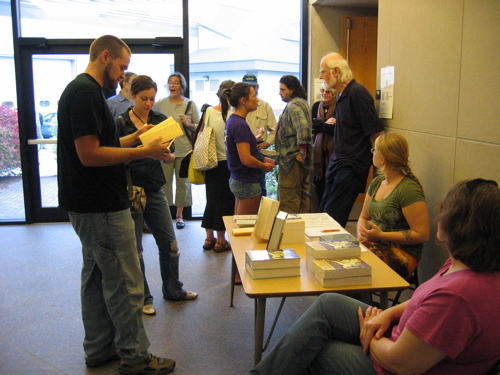 The event was co-sponsored by the New Writing Series and the UMaine Honors College. Padgett read exclusively from his just-published volume How to Be Perfect. A complete set-list can be found below. While a mix-up prevented the event from being videotaped, an 8-bit mp3 file of the reading is available by request. 55 08	Q: What is the point of writing poems, especially poems like yours? 56 21	Q: How do you define what a poem is? 58 22	Q: How does being a translator alter your relation to your own language? And why did you choose to translate Apollinaire? 03 00	Q: What is the most frustrating thing about being a poet? 04 45	Q: How did you develop the courage to write whatever you wished? If you can’t make tonight’s reading in Orono, or if you can, but can’t get enough of Ron Padgett, he’ll be reading again at the Colby College Museum of Art tomorrow, Thursday, 13 September, at 4:30pm. Padgett, who has collaborated with many artists in the course of his career, including Alex Katz, will read in the Paul J. Schupf Wing for the Works of Alex Katz. Have a look at this season’s Series poster, designed, as always, by the talented MaJo Keleshian. To request the real thing, respond in the comment field to this post or e-mail NWS coordinator Steve Evans (steven dot evans at maine dot edu). For a pdf, click below. 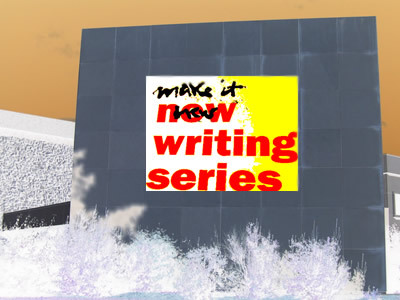 The New Writing Series enters its eighth exciting year this fall with a terrific line-up of poets, fiction writers, translators, scholars, and activists. Except where otherwise noted, readings are at 4:30pm at the Soderberg Auditorium on the University of Maine campus in Orono. For more information about individual events, please check this blog regularly. The NWS is also now on Facebook. For members of the “Maine” network, join us here. For general users, go here.